Facebook gaming and iOS gaming are on the rise, but Nintendo boss Reggie Fils-Aime thinks that the House of Mario can win the day. If you were a fly on the wall at the Game Developers' Conference in recent years, you might have gotten the impression that the new Big Things in gaming are mobile games - with the iPhone leading the way - and social games on Facebook. 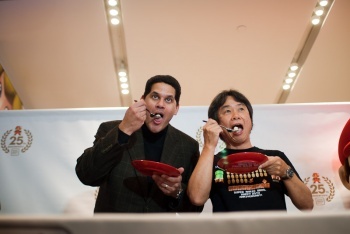 Nintendo isn't ignorant of these new threats from challengers that aren't established rivals Sony and Microsoft, but Nintendo of America bigshot Reggie Fils-Aime told MSNBC that the Big N was confident in its success. "You win with great content, and we're fortunate to have franchises like Mario, like Zelda, like Donkey Kong," said Fils-Aime. "All of these great franchises really motivate consumers to buy the software, and what they're looking for is an in-depth, great experience, and that's what we offer." Fils-Aime called the industry "cyclical" in respond to a question about the Wii's faltering sales - and whether Nintendo was expecting the 3DS to pick up the slack. "There're lots of systems sold early on, and then later on it's driven by software. So for us, 2008, 2009 2010 were fantastic software years and that's where the profit is made." Given that titles like New Super Mario Bros. Wii sold roughly a hojillion copies, I can't really argue with that. When asked if he thought Nintendo had inadvertently exposed a weakness by not releasing a new Wii to compete with Microsoft's Kinect and Sony's Move this past holiday season, Reggie pointed out that they actually had, in fact, done such a thing. "You know, we had a new version of the Wii, it was red." I can't be the only one who finds that response hilarious, can I? But no, Reggie was serious, and congratulated Microsoft on its success. "[It] did phenomenally well on a global basis as we celebrated Mario's 25th anniversary. So we give credit to Microsoft for what they've done. Anything that's good for our industry is good for all of us."